Features a monkey, lion, elephant, turtle, giraffe and little bird/birdie/chick. Features: shades of PINK, BROWN, GREEN, and ORANGE color theme. 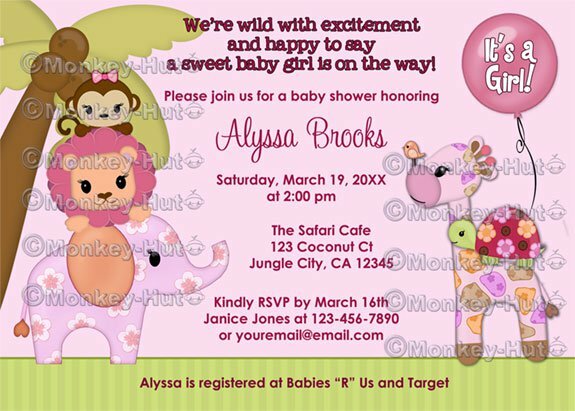 This MonkeyHutDesigns baby shower invitation coordinates with many of today's popular baby crib bedding set(s), such as the Sweet Safari set, and many others. This invitation can match just about any jungle safari theme for a GIRL. (2) Your own WORDING or wording as shown in the invitation for top border. 2. You will receive a proof within 0-3 BUSINESS days (not including holidays and weekends). Please ensure to get all needed information to me ASAP. Processing of your invitation does not begin until cleared payment & all info has been received. I also offer several of my designs on Zazzle, where they are printed on high quality paper/card stock and each invitation comes with an envelope. The ©Monkey-Hut copyright watermarks across the previews are for image protection and will NOT appear on the actual item you will receive. All artwork, products, and images are ©2000-2012 Connie Girga (aka Monkey-Hut / MonkeyHutDesigns). This item is for PERSONAL USE only. You may not forward, share, sell or distribute. Artist retains copyright and artwork images are NOT to be reproduced in any way. All rights reserved.